The echo box performs exactly as its name implies. If you tap out a rhythm on the lid, it will tap the same thing back to you. Except it isn’t tapping to make the sound, but vibrating. The concept is similar to the Knock Block. 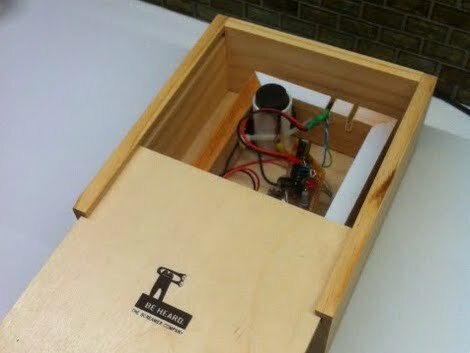 In that hack, a piezo element detected a rapping on the wooden enclosure and repeated the rhythm by striking the lid with a solenoid. This iteration also uses a piezo element as the sensor. In the image above you can see a segment of PVC pipe in the upper corner. That houses the element, sandwiched between two pieces of wine bottle cork. That cork just touches the lid of the box, transferring the vibrations to the element. The sound is created by a motor with an offset weight on its spindle. When the motor spins, it causes vibrations. The enclosure is one wood box inside of another, so the vibrating motor cause the inner box to shake against the outer one to make noise. Hear it for yourself in the clip after the break. what is up with all these videos with black bars on the side? otherwise, nice project! i have a piezo, and may try it out! Looks like he used some image stabilization software to get rid of shaking caused by holding the camera in his hand. I guess he just trimmed off the parts of the resulting video where the individual shaky frames would be moving around inside larger stable frame. It’s what happens when people shoot video with their phones turned vertically instead of sideways. Brett W. said it perfectly.